A hot new hat for dogs that's available exclusively from The Dog Treatery! This Hat is on Fire! Nothing makes your dog's birthday party photos more fun, or the star of the party more stylish, than a party hat from The Dog Treatery! A fun message saying “Hot Dog, it’s My Birthday!” reflects your dog feeling on their big day. 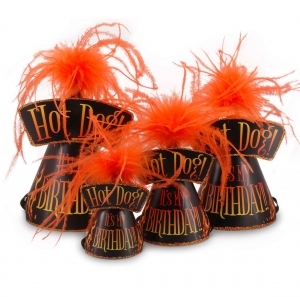 Each hat has ribbons to tie underneather your dog's chin and is adorned with flames, glitter and ostrich feathers! Looking for a Human Hat? Choose "Human Hat" in the options - we'll include extra ribbon and omit the dog-style ear slots! Want their name on the hat? 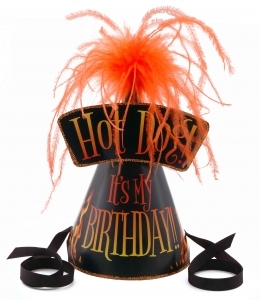 Click Here for our fully customized dog party hats.